Coordinating clinical care and managing increasingly complex administrative functions are becoming more important as practices evolve to improve patient outcomes and financially thrive. While MicroMD PM + EMR offers a host of standard reports within the software, many practices have specific needs for data to assist them in managing their workflows, tracking patient results across care settings, securing PCMH designation, meeting quality initiatives and documenting audit information. If you have a need for a report that doesn’t exist in your MicroMD software, work with us to create one. Contact us to learn more about tools and training to access and report on data from your own database or ask us to create a report for you. 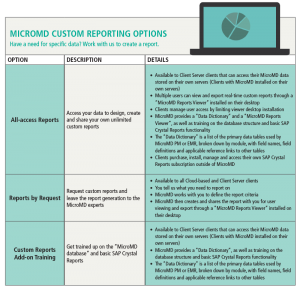 Design and create an unlimited number of custom reports within your own SAP Crystal Reports software and share those real-time reports through a free “MicroMD Reports Viewer” installed on user desktops. A great fit for organizations that host MicroMD software on their own servers and have business analysis and/or HIT resources who understand the basic inner workings of the MicroMD PM + EMR software and databases. MicroMD is available to help define, create and deploy custom reports for you. This is great alternative for clients not interested in designing and creating their own reports, that don’t have business analysis and/or HIT resources or only have a need for a limited number of custom reports. Are you already running your own custom reports with SAP Crystal Reports, but can’t quite figure out how to get at (or combine) data in certain places? If so, we can provide the MicroMD “Data Dictionary” and dedicated training hours. Looking for more info? Get started here!